Right up front … I don’t have any tattoos and for the most part, I ignore them on other people. So why am I talking about them? I received an email from someone who has been a chef for the last 10 years and wanted to know what my opinion was on tattoos within the profession of architecture. At first, I thought this was an easy question to answer, but after letting it bounce around my head for a while, I’m not sure I know how to respond. In order to respond to this email and articulate a position, I decided I should figure out what I actually thought about tattoos and would the presence of tattoos on an individual color the way I view them as a professional. The person who sent in the email told me that he has two “full sleeves” meaning that both of his entire arms – from the wrist to his shoulders – are completely covered in tattoos. Generally speaking, I don’t understand the motivation that would cause someone to permanently mark their body with a tattoo. There are some instances where I understand why – like the great number of individuals in the service who get tattoos that will identify them with a certain branch of the military – I get that. If you are going to put your life on the line and count on the people around you to help make sure you don’t die, you get a free pass. The tattoos I don’t understand are the “barbed wire around the bicep” type tattoos. I can’t help but think that eventually your current super-awesome arm, full of muscles and looking sweet – is going to look like a pair of pantyhose with laundry stuffed into one leg once you become a senior citizen. Not as cool anymore but does anyone really care about that sort of tattoo in the workplace? Once you’re dressed for work it won’t be visible … so no big deal right? Maybe, but what we are really talking about here is the perception of the individual and the thought process of getting that tattoo in the first place. I had a potluck roommate in college who had a tattoo … but it wasn’t just the choice of tattoo [shudders] that he choose, but the location [double shudder]. It is possible that this experience might have jaded my opinion. 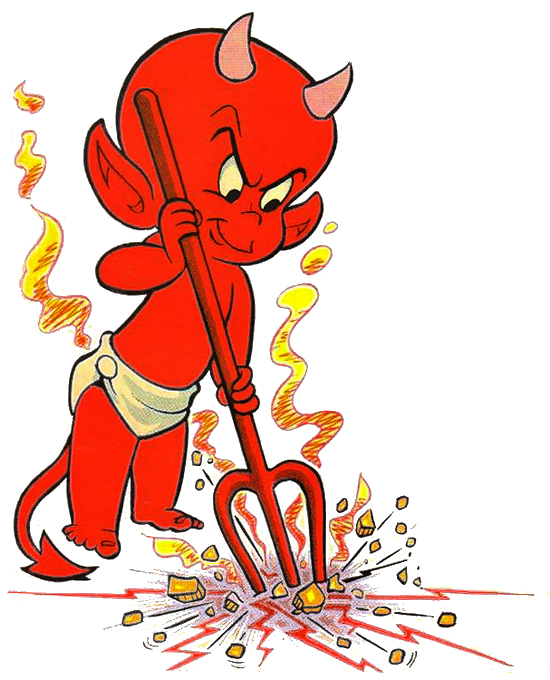 This is ‘Hot Stuff‘, a character from the comic book associated with ‘Casper the Friendly Ghost’ and ‘Wendy the Good Little Witch”. This was the tattoo that my roommate had so lovingly placed on the inside of his thigh … high and tight to his … ahem, (whispering) groin. In his version of the tattoo, the trident that Hot Stuff was carrying was pointing towards his hot stuff and in script underneath were the words … you know what’s coming here, don’t you? … it said “Hot Stuff”. I know what you’re thinking, but no, it wasn’t hot. It was very, very far from hot. It was my daily torment to see my roommates “Hot Stuff” because he liked to be in our dorm room “au naturale” as often as possible – which pretty much meant whenever he was in our dorm room. As you can surmise, he and I did not stay in touch after that year. I have no idea where he is or what he is doing now, but since he was the first person I had up close and very personal experience with who had a tattoo, it’s possible that I might have transferred some of my opinions of him onto all people who have tattoos. Back to the original question: Would a person who is considering the field of architecture experience any difficulties if they had tattoos? Should it matter if someone has tattoos? I know that we architects are a purportedly creative and receptive group artistically, so that adds a bit of a wrinkle to this question. For me and my office, I concluded that it doesn’t matter as long as it isn’t visible when dressed for work. We don’t have any jobs here where you can sit comfortably in the back flexing your creative abilities and not interfacing with the client. Since that’s the case, you have to realize that you don’t just represent yourself, but the people and company you work for. I am put in a position to represent and speak on behalf of my company daily and there isn’t any doubt that my appearance is judged by the individuals I address – they are professional people and there is a certain amount of professionalism that is expected. Does a tattoo prevent me from being professional? Of course not, but I’ve said it here before – when you work in a service industry, perception is reality. I really wanted to conclude that having an assortment of visible tattoos on an employee would be a non-issue – and it still could be based on the job they were filling. In trying to address this question, I attempted to make it a black and white issue but I don’t think that’s possible. There are many things that would come into play – where the tattoos are located, the content of the tattoo, the role of the employee, etc.